On the Home screen by default the app's name will be displayed. Sometimes it is needed to change this display name. In this tutorial the display name will be changed using a property list item. This tutorial is made with Xcode 10 and built for iOS 12. 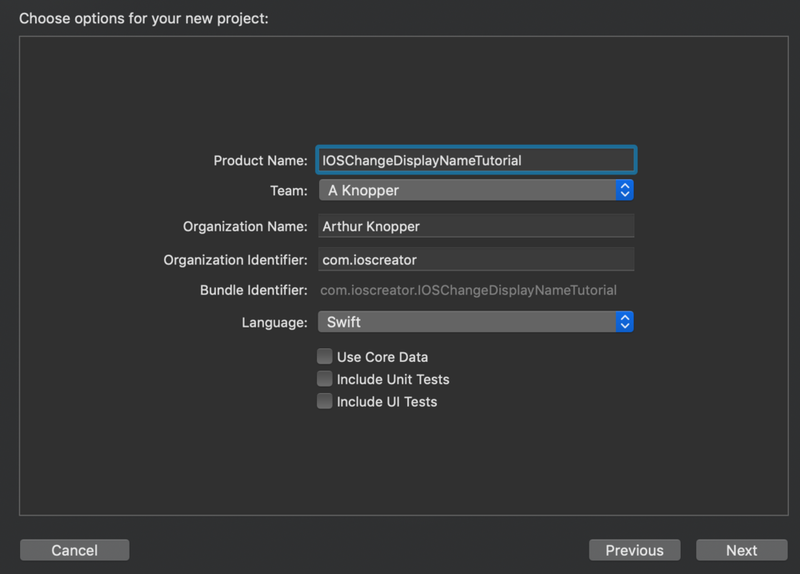 For product name, use IOSChangeDisplayNameTutorial and then fill out the Organization Name and Organization Identifier with your customary values. Enter Swift as Language and choose Next. Build and Run the Project, go to the Hardware menu and select Home. The current app's name is too long to display and therefore it is truncated. Go to the info.plist file Right click on any item and select "Add Row". Choose Bundle Display Name. Give the row the value NewName. Build and Run the app again, go to the home screen to see the new display name. You can download the source code of the IOSChangeDisplayNameTutorial at the ioscreator repository on Github.